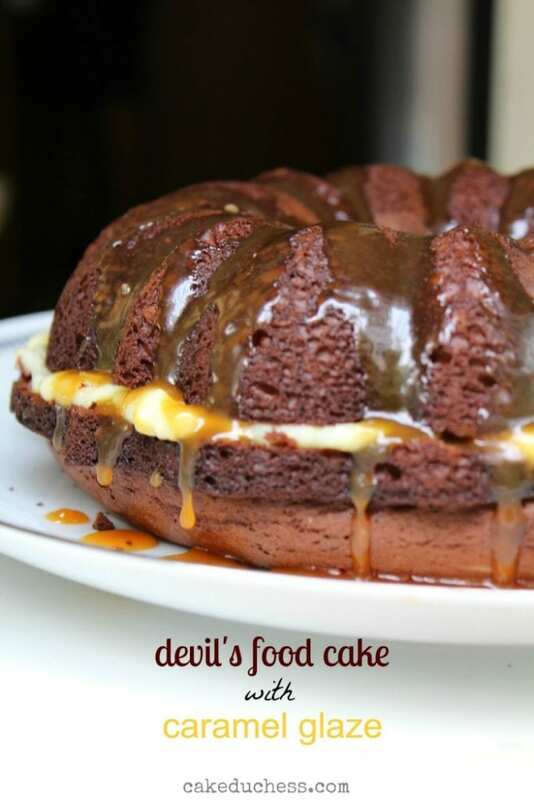 Devil’s Food Bundt Cake with Caramel Glaze is just incredible! A whole year of baking a different bundt every month. How did this happen? 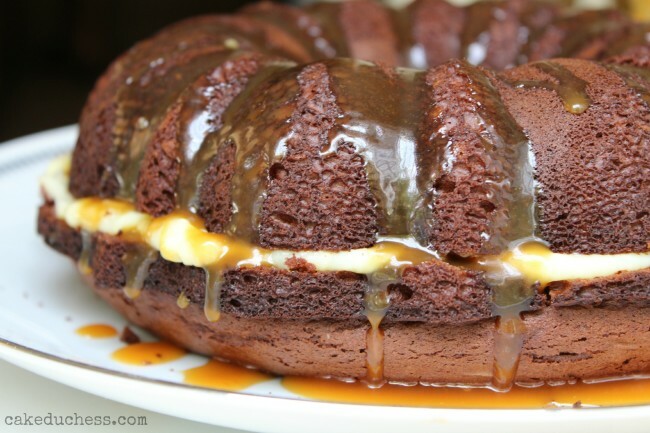 Yes, this Devil’s Food Cake Bundt with a Caramel Glaze is to celebrate the anniversary of #BundtaMonth. Anuradha and I declared our love of baking beautiful Bundts exactly one year ago. We were in this bundt baking business for the long haul! The first bundt I shared with the group was actually a chocolate one…a Chocolate Zucchini Swirl Bundt cake, to be exact. Oh, I forgot how good that bundt was! There were 7 of us bakers proclaiming our love of bundts that first month. This is a rich chocolate cake. A moist chocolate cake. It’s a wonderful cake that would be fine even with a simple dusting of powdered sugar (the way I like it!). But to celebrate this month, I had to make it a little more fancy. I had so much fun with my July bundt using caramel and pastry cream and had a couple requests from it since it was baked (ahem…my neighbors!). So there was no hesitation in deciding what do bake for September. And you know that chocolate and caramel are a dangerous and delicious combination! For the pastry cream, here is the recipe. For the caramel glaze, here is the recipe. Position rack in center of oven; preheat to 350°F. Butter a bundt pan and dust the inside with cocoa powder, set aside. Combine cocoa powder and milk chocolate in medium bowl. Pour 1/4 cup boiling water over; whisk until mixture is smooth. Whisk flour, baking soda, and salt in another medium bowl. Using electric mixer, beat both sugars, oil, egg, and vanilla in large bowl until well blended. Add flour and cocoa mixtures; beat until blended (batter will be thin). Pour batter into prepared bundt pan. Bake at 350° for 55 minutes or until a wooden pick inserted in center comes out clean. Cool cake in pan 15 minutes. Remove from pan; cool on wire rack. Carefully cut cooled bundt in half and spread pastry cream onto the bottom half. Cover with the other half of cake. Drizzle on the caramel glaze. YAY!! Cheers Lora! Our love for bundts has stayed strong. Heh. I'm so glad we got together for this! Here's to the many many more delicious years to come and I hope one day soon we get to bake together! Love, Anuradha. I love being a part of this group! I'm so happy you an Anuradha formed it and invited us all in. This cake is amazing! Love the pastry cream filling and oh, that caramel! YUM! I really need to try splitting a cake and filling it. I love when you do that! Lovely! Every time I see your homemade pastry cream I want to go make some..but never do, jaja! The flavors are awesome Lora! I haven't made devils food in years. You're tempting me. It's been such a fun year and seeing all the bundts each month has been fantastic. What a wonderful cake you baked for the anniversary. Chocolate and caramel are a winning combo. Good lookin' bun[dt]!! LOL, but really, I wish I had a HUGE slice of this! This is indeed a well dress cake for the occasion save some for me please. What a great combination of flavors – chocolate, caramel and pastry cream all forming a delicious bundt. It would be very hard for me to stop at just one slice of this cake. What a beautiful, over-the-top cake filled with pastry cream and more! Definitely a celebration cake, happy 1 year of Bundt Baking! You just can't go wrong with pastry cream and caramel. You just can't! So delighted to be a part of Bundt-a-Month, Lora. It's something I look forward to for weeks! Your bundt cake looks delicious! The pastry cream puts it over the top. I happen to have posted a bundt cake on September 1st. Could I update the title and add my link to the party? Oh Lora you had me with that glaze! I will bet it tasted fantastic! I'm so glad you do this series, Lora 🙂 And this chocolate bundt cake with all that delicious caramel looks like a real winner to me. Thank you for sharing! A beautiful cake and that glaze is good. Oh my goodness, I love that you made it into a layer cake. Serious yum! Wow! can you guys believe it's been a year?! I'm so glad you guys started this baking group. . it really has been so fun for me. What an amazing bundt! I'm totally trying this one! love the pastry cream and caramel glaze!! and love that your neighbors suggested it! 🙂 I hope you have a fabulous birthday today!! enjoy it and have fun! This is seriously fancy! The pastry cream in the middle with the caramel drizzle sounds incredible…please send me a piece! Also I'm so glad that I'm a part of the group…it's been a fun few months for me and happy anniversary to you! Gorgeous bundt, Lora. I'm drooling over that caramel glaze! Time flies when you're having fun! Your cake came out beautifully and big thanks to you and Anuradha for keeping us all together. Happy Anniversary and may we have many more! Oh my gosh Lora, This bundt cake looks so delicious and decadent! Happy one year anniversary to #BundtaMonth! This is definitely one of my favourite foodie parties out there. All of you ladies work absolute magic with your bundts and this one, Lora, is no different. I love that you sandwiched pastry cream in the middle of your cake. This is the perfect thing to make for a celebration! I have been dreaming of a chocolate bundt and here you make one just for me!!! Happy one year Bundtabirthday!!! You have paraded an amazing selection of luscious bundts in front of us and I wish I could taste every one! That is beyond decadent. Holy wow yum! I have been here since the first month, but I submitted through the linky for that first one, and this remains by far and away my favorite blogging event–and the one I have stuck with the longest and most consistently. Thank you SO MUCH for starting it! G'day Lora! Love your cake glistens today to me!